Hyderabad (Agenzia Fides) - The Catholic Medical Association of India (CHAI) is leading a campaign to tackle cases of tuberculosis, in collaboration with government agencies and other civil society organizations: this is what Redemptorist Fr. Dr. Mathew Abraham, CHAI Director General. Every hour more than 50 people die of tuberculosis in India. The disease kills more than 1,200 people every day. The Catholic Medical Association of India is formed by doctors and healthcare professionals working in Catholic hospitals, health centers and institutes in various Catholic dioceses throughout the country. It is part of a wider network linked to the Indian Bishops' Conference of India, which includes 500 hospitals, over 2,000 primary care facilities and more than 200 organizations involved in social services. Over the last four years, the Association has focused on strengthening the national tuberculosis control program through advocacy, communication and social mobilization, explains Fr. Abraham. CHAI is partner of the coalition between the International Union against Tuberculosis and Pulmonary Diseases (Union), the Ministry of Health and Family, the Government of India (Central Division for Tbc). The program works to improve the scope, visibility and effectiveness of the fight against tuberculosis. The control program, promoted by the Indian government, provides free TB diagnosis to more than 1.5 million patients every year. The CHAI project activities provide district-level assistance covering 96 districts in 10 states of India (Maharashtra, Kerala, Karnataka, Tamil Nadu, Jharkhand, Madhya Pradesh, Chhattisgarh, Uttar Pradesh, Punjab and Nagaland). This is largely done through the creation of networks established with 380 NGOs (and 2880 volunteers) who monitor and lead awareness raising campaigns in small communities, many of which are composed of poor and tribal people. 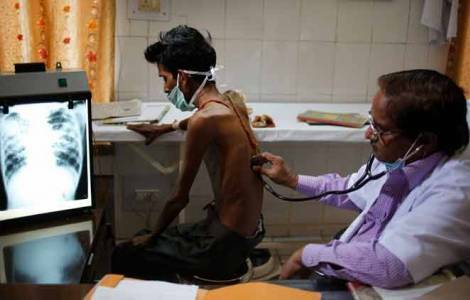 According to a study on the health situation in India published by the scientific journal "Lancet" in May 2017, despite the socio-economic development of the country, India has failed to achieve the expected health targets and the general situation has deteriorated over the past 25 years . Although India's score in the Health Index has risen from 30.7 in 1990 to 44.8 in 2015, performance in the fight against tuberculosis, diabetes, and rheumatic heart disease and chronic kidney disease has worsened. India has the largest number of cases of tuberculosis in the world. According to the World Health Organization, in 2015, India reached 2.8 million cases compared to 2.2 million in 2011. While tuberculosis killed 220,000 people in 2014, the rate increased to 480,000 in 2015, which means that almost 1,300 people can die from illness in just one day.